You are currently browsing the tag archive for the ‘lgbtq’ tag. Throughout its history young adult literature has offered too little representation of diversity in terms of its characters, setting, plot, and other narrative elements. The U.S. population has become more diverse by the day, yet white, middle-class, suburban-dwelling heterosexuals have continued to dominate all genres of YA literature. In her germinal work Shadow and Substance (NCTE) Rudine Sims Bishop was among the first to document the changing representations of African American characters in literature for youth. Since then – thanks in large part to the appearance of the ‘new realism’ in young adult fiction in the late 1960’s — other non-mainstream groups have slowly begun to appear in YA fiction. The first young adult novel with LGBT content was published in 1969, the same year that the Stonewall riots marked the birth of the gay liberation movement. Lesbian, gay, bisexual, transgendered, queer and questioning (LGBTQ) people have come a long way since 1969, but depictions of LGBTQ people in literature for teen readers have moved at a glacial pace, going from invisibility to stereotypes to (finally) realistic characters portrayed with some degree of frequency, authenticity, and art. 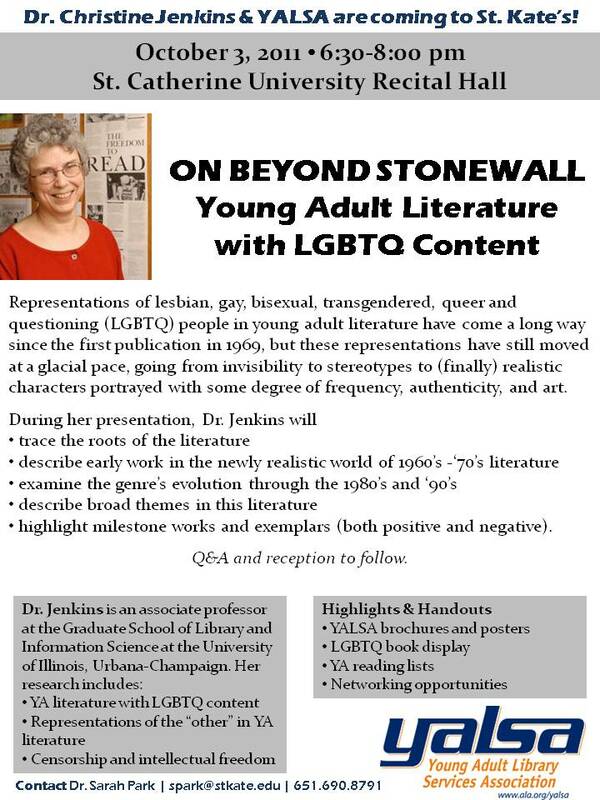 Jenkins’ presentation will trace the roots of the literature, describe early work in the newly realistic world of 1960’s -‘70’s literature and examine the genre’s evolution through the 1980’s and ‘90’s. She will describe broad themes in this literature and highlight some milestone works and exemplars (both positive and negative) among individual titles published during this period. highlight milestone works and exemplars (both positive and negative). Q&A and reception to follow.